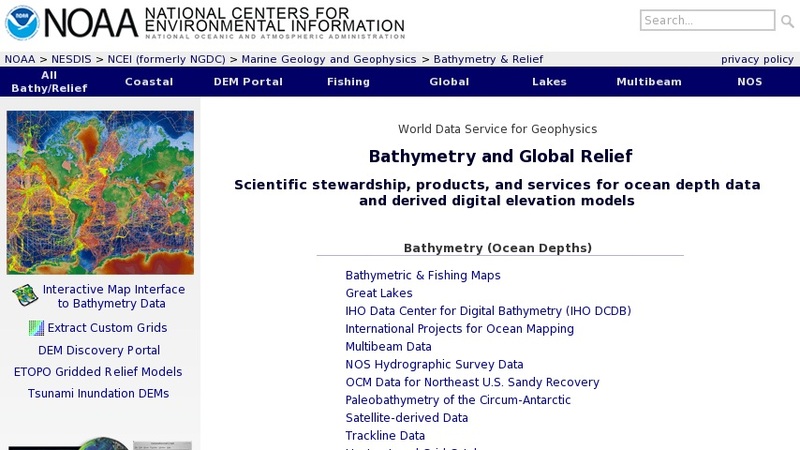 This extensive site from NOAA's National Geophysical Data Center provides a collection of bathymetry, topography, and relief data from a variety of sources and environments including coastlines, the Great Lakes, and the seafloor. The site also features the National Ocean Service (NOS) hydrographic database. Some images and data can be downloaded at no charge, while others may be purchased on CD-ROM or DVD. The site can be searched for downloadable data using the GEODAS Data Search and Retrieval System. Data products from NOS surveys, including Descriptive Reports (DRs), smooth sheet images, survey data images, textual gridded data, and sidescan sonar mosaics, are available for download using the National Ocean Service Hydrographic Survey Data Map Service, an ArcIMS interactive map and data discovery tool.